Two years ago, I took a sabbatical and decided to travel solo through India and Southeast Asia. I didn’t want to follow a guidebook, so instead I had my friends write adventures for me to complete each day. Incredible things happened, and unexpected experiences ensued. (Hey, I even asked Steven Tyler for a mantra.) I changed and grew as a person – and now, am turning this original project into a business to share that joy and inspiration with others. My mission was to embrace “yes” fully, jumping into new cultures with all senses and no expectations, pushing through perceived limitations and unforeseen consequences, and pulling out those nuggets of inspiration and intention that I tended to overlook in the daily grind. 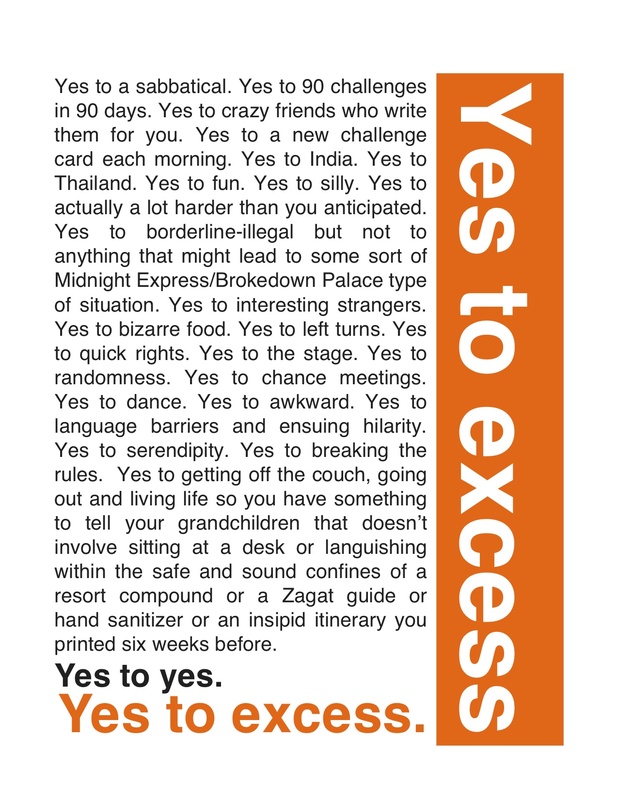 Yes to Excess was not about material excess or hedonism, but about an excessive and adventurous way of being that’s open, honest and willing… at its most basic, it’s pretty much just saying yes. Here’s how it worked: I enlisted my amazingly creative and brilliant friends and family to (collectively) give me at least 90 challenges to do in my 90 days away. They could be deep, physical, silly, serious, ridiculous or just plain adventurous… but, they had to evoke an emotion, needed to be feasible for most global locations, and couldn’t get me arrested. Every morning, I picked a new challenge and posted it here and to Instagram. I (and all of you, if you chose to accept this mission!) had 24 hours to complete each day’s challenge. Over 100 people emailed challenges and my amazing friend Anne turned each one into a challenge card for the envelope. Every morning, I flipped a card, and that was what I did each day. I started to receive notes from people doing the same adventures back at home, and eventually got requests from friends who wanted their own Yes to Excess decks for their travels. Oh, I am so excited for this! Thanks, Nancy! So glad you’re following along. This sounds so scary. I think I might have (to try) to do it. Whoohoo! Start with the fun ones… I’m excited that we’ll get to do this together. Can’t wait! Send on some challenges! This is awesome, Cara! Cannot wait to keep up with you.